Mediarun.pl reports that Polsat TV’s Warsaw New Year’s Eve Party was watched by 3,65 mln Poles with audience shares of over 30% in the 4+ group. During the midnight celebration (between 23:50 and 00:10) the audience rose to 4,27 mln people. The second channel of Polish national television TVP2 which organized the competing open-air party on the Wroclaw Old Town square – had an audience of 2,75 mln people. Is there anything better than to celebrate a New Year with your favourite band on the stage? Don’t think so. I will not write a extensive review as I’m no writer. Just to let you know – I’m really happy about the yesterday’s Roxette performance – they sang live, three songs in each of two sets, no backing female singer this time and no new single. Some funny reports were shown on the screens before the first Rox appearance – they showed their arrival to Warsaw, cameramen followed them on their way from the airport to the hotel and stage – it all looked like the royal familly’s visit, not our’s humble duo. But well, they are super stars after all, so good for them! Though I’m totally satisfied with the show and the weather (just -2C, no snow), I’m not so happy about the crowd – it was quite dangerous and some drunk people just couldn’t enjoy the show in the nice way. I’m sure you know this by now, but Marie wore the “Milk and Toast and Honey” video coat. Very strong winds blew during the first part and it looked almost the same as during the Stavanger gig in August 🙂 Over 120,000 people were on the Constitution Square in the centre of Warsaw. Though we were informed during the show that it is broadcasted on Radio ZET as well, but unfortunately, it wasn’t (or at least it wasn’t on the internet). So I would like to apologize to all the international fans for that piece of information I gave you few days ago which could have been misleading. General rehearsal takes place NOW. Dressed for success, Joyride, It must have been love, Sleeping in my car, Listen to your heart, The Look. I was informed today that Radio ZET, the New Year’s Eve Party media partner, will broadcast this show live on its site. So all international fans who are eager to listen to Roxette on the New Year’s Eve day will be able to do so online. You can even download an iPhone app and listen to Radio ZET through your phone. Unfortunately, Polsat TV has no official online broadcast. This TV report will be uploaded on You Tube shortly. Thanks to Polish roxette.pl Facebook fans for this piece of information. Polsat TV presented two new ads for the New Year’s Eve Party in Warsaw. The first one uses two Roxette songs in the background: “Joyride” and “How do you do!”. In the second one Marie and Per appeared – the ID was recorded in Moscow while recording of the Russian “Olivier” show. Per says in Polish “Badzcie z nami”, which can be translated into “Be with us (there)”. 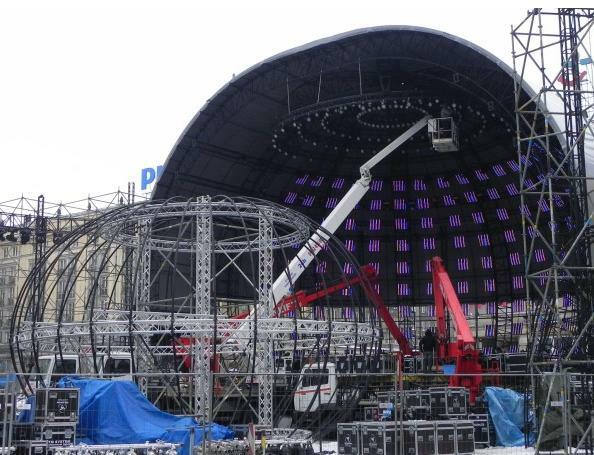 In only 9 days Roxette will perform on this stage in the centre of Warsaw on the New Year’s Party organized by Polsat TV and The City of Warsaw . By the way… -15 C degrees is expected here in Warsaw on December 31st. That will be a very cool evening for sure. Update: Agata Mlynarska, one of the New Year’s Eve Party hosts, revealed that Roxette would perform in 3 sets – two sets before the midnight and one on January 1st. It seems like they will perform 2 songs in each set. There is also a chance for another song according to Polsat. It is still unknown what the 6th and possible 7th song will be. According to roxette.pl Facebook fan page user – Krzysztof Charchuta, Polsat TV broadcasted a new interview with Per Gessle in a showbiz programme “Sie kreci” yesterday. Per Gessle said that Roxette would perform 6 songs in Warsaw and he named 5 of them: “Joyride”, “It must have been love”, “The look”, “Listen to your heart”, “Sleeping in my car”. Unfortunately, he did not want to reveal the 6th song’s title. Update: Here is the photo from the interview. Per said that they would sing 6 biggest hits, so I do not see a possibility to hear “She’s got nothing on (but the radio)” in Warsaw. According to Polsat TV‘s press office – Roxette will definitely perform live on New Year’s Eve party on December 31st in Warsaw. As for the chosen songs, they cannot reveal anything at the moment. They do not want to say how many, which and if any new song will be performed neither. The Polsat press releases informed about “It must have been love”, “Listen to your heart”, “Joyride”, “The look” being performed in Warsaw; on the other hand “How do you do!”, “Dangerous” and “Sleeping in my car” are also used in various TV and radio promos. Meanwhile, in the streets of Warsaw, in the press and all over the internet the New Year’s Eve concert’s promotion has just began entitled “Sylwestrowa Moc Przebojow” (Power of New Year’s Hits). As you can see below, Roxette’s photo is not on the posters – Polsat TV decided to use only the Polish artists images. Other foreign guests to perform in Warsaw are Opus (“Life is life” theme) and Denzel (“Pump it up”). The Polish artist will perform the most popular European hits as Polsat and the Warsaw authorities want to mark the start of Polish Presidency of the European Union in the second half of 2011. This will be probably the first time ever when Roxette will perform in front of over 100,000 people. Close to 4,000,000 people are expected to watch the show on Polsat TV. Unfortunately, Polsat has no official live streaming on the internet. The other media partner is Radio ZET, which should broadcast the show as well and yes – you can listen to it all over the world. The official event website has just opened its gates, though it is only in Polish. The admission to the Constitution Square will begin at 7 PM, one hour before the whole show will start. Between 2 and 7 PM soundchecks and general rehearsal will take place. If you have any question regarding this show, just drop a line in the comment section. The official press release was sent to the Polish media today. Roxette will be the main star of the open-public, free New Year’s Party on Constitution Square in the centre of Warsaw. As we previously informed the rumours had it that Roxette was due to perform in Lodz, third largest Polish city, but due to the financial problems, Lodz authorities had to cancel this open-air public New Year’s Party for citizens. According to this information, Roxette will come to Poland in a private jet and will perform the biggest hits eg. “Joyride”, “It Must Have Been Love” or “Listen To Your Heart”. The show will start at 20.00 CET and will last for more than 5,5 hours. City Council gave over 900,000 EUR to organize this event. The New Year’s Party in Warsaw will be broadcasted by Polsat TV and Radio ZET.